The Greensboro Housing Coalition had been concerned about the Avalon Trace Apartments in East Greensboro for years. 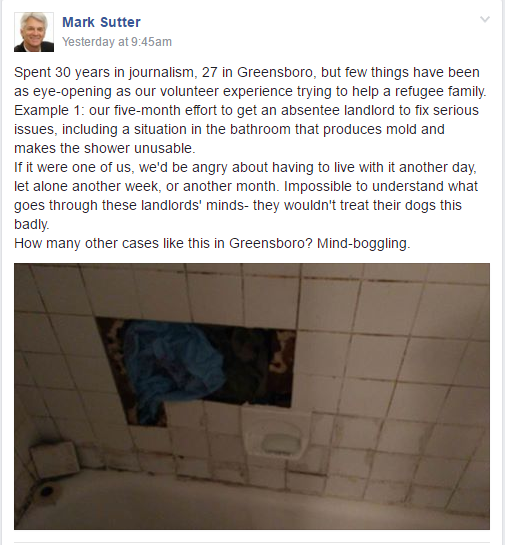 "I used to get called out to this property all the time for things like roof leaks, mold, roach and mice infestation and it came very disheartening that we couldn’t get much done to get those tenant problems resolved," Executive Director Brett Byerly said. ...there was a baby less than a year old that spent more time at the hospital due to respiratory conditions than he spent at home the first year of his life," Byerly said. ..."You would expect in a 170 unit apartment complex to get 2 or 3 annual visits for an asthma diagnosis, what we found was there was 30 patients producing 120 visits," Byerly said. "It was 120 times what you would expect statistically so the health system had an 'aha' moment in working with housing people." "We lifted up the blankets in the crib, the crib could have crawled away that was the level of cockroach infestation." ..."When we merge two data sets which are neighbor level and neighborhood housing conditions, we saw hotspots that correlated bad housing and high spikes in asthma cases," Sill said. He was able to narrow the research down even further. ..."Byerly said there are few real repercussions for bad landlords unless tenants sue in civil court. The City of Greensboro says the apartment complex was never condemned, but 11 individual units were at one point. That number of condemned units has gone down to seven..."
that dominate in the industry or sector it is charged with regulating. is often worse than no regulation whatsoever. I’m also on the board of the Triad Apartment Association. The apartment association is a member of TREBIC. and decreased overall housing complaints by 77 percent. The vote was tied 6-6. (Ayes: Dellinger, Nelson, Placentino, Chaney, Sims, Perkins. The vote died due to lack of a majority."